For the first time, deep brain stimulation (DBS) has been shown to treat people suffering from major depression. 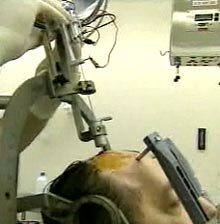 DBS has been used to successfully treat epilepsy and Parkinson's. About twenty percent of depression sufferers fail to respond to standard treatment; medication plus electroconvulsive therapy may work for some of them. Dr. Andres Lozano, professor of neurosurgery at the University of Toronto, explains why DBS is a more refined choice. "Electroconvulsive therapy is analogous to rebooting your computer," he explained. "This [deep brain stimulation] is very pinpointed, precise therapy, involving a very precise area of brain that plays a key role in depression." When people are acutely sad, the subgenual cingulate region, or Cg25 region, of the brain, becomes active. Antidepressants can reduce activity in this area somewhat. "It was as if the thermostat was set for 120 degrees and you want it to be 70 degrees," Lozano explained. "This area of the brain is running in overdrive, and it is causing depression and also interfering with the function of areas of the brain that are involved in cognitive function." Since this study only involves six patients, it can offer only the most preliminary results. But after a hear and a half, a "striking benefit" has been seen in 4 of the 6 patients in the study. Science fiction readers may recall the wireheads of Larry Niven's stories; a wirehead is a person who installs a droud to deliver a minute electrical current to the pleasure center of the brain. Niven creates a realistic picture of the social consequences of this technology in Ringworld. Read more at Brain Pacemaker may help worse cases of depression; thanks to Jeff Schwenneker for providing the tip on this story.